It was an age of great discoveries. New and wonderful items found their ways into the hands of the greatest merchants. And if there ever was a place those traders loved, it was the town of Dale. There’s an extraordinary guild in the Dale founded by the greatest merchants. The tricky part is getting the membership as only the winner of an annual trading competition would be invited to the guild. Notable animal merchants from all over the world have gathered in the town to take part in said event. Everyone has only one goal in mind – be celebrated as the winner of the competition and gain membership in the honourable guild. Players take the roles of those participating merchants learning new techniques, trading goods and managing their stock. The player who first manages to co.. The world has grown smaller. Civilizations around different continents have established independent free trade cities in order to ease trading between distant lands. One of those cities, Yengzuh, is now looking for a new ruler – a new Trade Master. The post is only open every ten years and the selection of the said individual is no small task. It’s handled by holding a trading competition as it’s in everyone’s best interest to get the best merchant chosen for the job. All the participating merchants are prestigious, but the competition also tests their ability to deal with unexpected situations. After all, the winner will be responsible of keeping the global prices more fair and stable for years to come. There are only twelve free trade cities in the world. Yengzuh near Pand.. 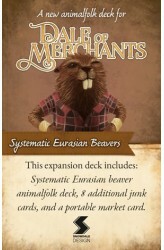 The Dale of Merchants: Systematic Eurasian Beavers mini-expansion includes one additional animalfolk deck to be used with either Dale of Merchants or Dale of Merchants 2. Beavers' effects happen only after certain triggers, which makes it really important to plan ahead. If you're crafty enough, you can create awesome combos with them. 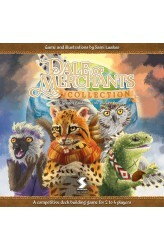 ..
Dale of Merchants Collection is a standalone game. It contains plenty of content aimed at fans of the series. 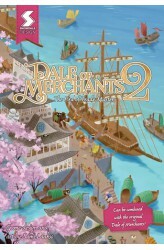 The game comes with a large box which lets you store all content both from the original Dale of Merchants and Dale of Merchants 2. 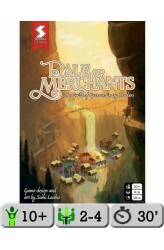 While this is a great storage solution to keep all your Dale of Merchants content in a single box, it does come with a ton of new things to play with. Dale of Merchants Collection introduces new animalfolk decks with such unique fellows as Wealthy Tuataras and Connected Emperor Penguins. A completely new feature in the series are the character cards. These cards are received at the start of the game and provide players with unique and powerful abilities that drastically influence the game. Dal..